Alexander John Marfel Cowmeadow started at Collingwood as a teacher of carpentry and cabinet making in 1927 and stayed at Collingwood for the thirty four years of his teaching career until his retirement in 1961. He was, for many years, head of the Cabinetmaking and Chair and Couch Making Departments. Besides his trade teaching activity, Alex was involved in the sporting activities of the school and also organised interchange visits between students of Collingwood and Goodwood Technical School in South Australia. Thirty four years at Collingwood with an active participation in almost all affairs of the school, had a marked effect on the outlook of Mr.Cowmeadow. After his death in 1970, it was discovered that he had left his property for the benefit of Collingwood Technical School. This generous gesture enabled the development of a much better school camp at Buxton, where two wings of the camp were named after Alex and his wife Doris Cowmeadow – reminders to the students of the generosity of their former teacher. 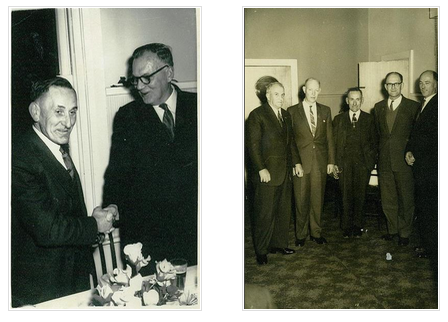 A farewell function was held for Alex Cowmeadow on 10 October, 1961. Alex Cowmeadow also donated his property at the foothills of the Dandenongs as an intended Staff Retreat, however, the school later sold the property and used the money raised to construct the Cowmeadow Wings as an extension of Camp Westlake.